Architecture/Landscape/Interiors alumna Jinnie Choi (’04) is a Designer, Set Designer, Art Director, Production Designer, and more! Most recently Jinnie renovated William Shatner’s house for “The William Shatner Project” on the DIY Network and can be seen on the Oprah Winfrey Network’s “Home Made Simple” starting TOMORROW, Saturday, January 10, at 9:00 am EST /8:00 am CST. Additional episodes that feature Jinnie will be aired on January 24 and January 31, 2015. 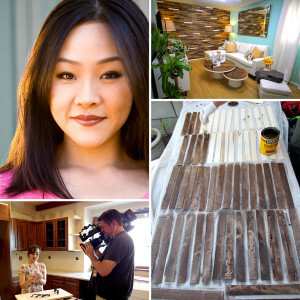 See Jinnie’s “Home Made Simple” promo HERE. See Jinnie’s resume and examples of her work as an Art Director, Design Producer, Production Designer, Set Decorator, Design Consultant, Design Coordinator, Host, and, always, as a DESIGNER on her website. The wall is made of recycled construction shims that were stained three different shades. The project included nesting coffee tables consisting of round table tops and wooden planters that were placed upside down.